Well, all I really know about haiku is that it they are usually about nature, and that the syllables are 5, 7, 2. Is that right? Sadly, no knitting was done today. 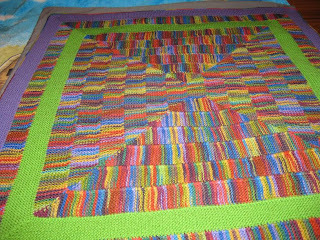 To make up for that, I am posting a photo of the 10-stitch blanket (see ravelry.com for free pattern) finished just barely in the nick (St. Nick, get it?) of time for Christmas for Granddaughter Addison. Late, as it was to have been for her June birthday. It was knit in many colors and in many states of the country as we traveled on vacation this past summer and fall. Whenever we climbed into a vehicle to go anywhere, the blanket climbed in, too. It grew a few inches every time, but the last few weeks before December 25, the stitches were flying off the knitting needles like needles off the Christmas trees in carpeted living rooms, racing to be finished in time. The finished size is about 45 x 50, if I remember rightly. It's knitted out of Red Heart yarn for durability in the hands of a two-and-a-half-year-old, and machine wash-and-dry ability for the sake of a busy mommy. This pattern is easy and fun to knit, going back and forth on just 10 stitches at a time, joining up along the side as you knit. The mitered corners make it interesting enough to keep you from being bored. 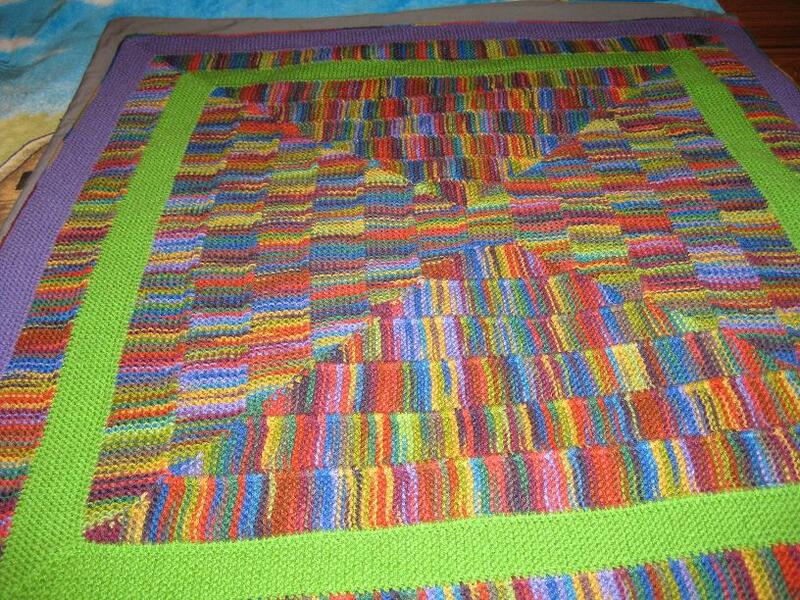 I love using variegated yarns for this, and if you can find longer color repeats, it ends up looking a bit more like a crazy quilt. Ravelry provides a round version as well which I may try next, although curling up under a round afghan presents problems in keeping toes and shoulders warm at the same time unless you can curl yourself into something like a doorknob or doughnut shape. Or unless you knit a HUGE circle, in which case you have a lot of excess circle just hanging off you, doing nothing, while your toes, middle, and shoulders are toasty. Maybe a photo or two. I tried a few minutes ago, and it crashed my system. Guess one at a time might be best. I had to resize the original photo to 25% of its size or it would have taken all night to download. The picture above shows 2 hats knitted with Plymouth Encore yarn. It is 75% acrylic and 25% washable wool, so it is machine wash/dry. Since these are for children, they will be easy to care for. The variegated one, made with Canadiana, 100% acrylic, was made a bit deeper from face to back of head to have better coverage of ears. All three are very soft, not scratchy at all. Elizabeth Zimmerman taught me several new things through this pattern, even though I've been knitting more than 50 years!! The attached I-cord and knitted-on I-cord for the borders, traveling stitch for the detail on the back, and the "saddle" top. Very easy to do, but I'd never had a pattern use these techniques before. I'll attempt to add a photo of the back of the ivory hat (the first one I made) before I sign off for the night. Then I'm ready for bed--what a busy day! 1/15/12: New Year, New Blog! It's mid-January, sort of the beginning of the year. No resolutions were made because I know I won't keep them. Making promises to myself and not keeping them just makes me feel as if I've somehow failed at something very "important." Flying by the seat of my jeans is what I prefer. Not making promises does not mean I've not thought about "important" things. Getting healthier is right near the top, as it is for almost everyone. Eating green vegetables may never be a priority, but I've learned that some famous, in-shape people (i.e. Anderson Cooper who had never eaten spinach until he tasted it on his TV show a couple of months ago), do not eat them either. When he told his audience he'd never had it, they tsk-tsk'd at him. His response: "What? Are you my mother?" Ha! Another item I've been thinking about is doing something with my talent(s) that might help others. Since retiring last year, I've had some time to knit. Heaven knows I have stashed away enough yarn to last until the Second Coming. I have begun to knit hats for charity. These are, for now, children's hats, but other items for kids and other folks may follow as time permits. Since my hands must be busy, and the yarn is plentiful, this is something I can do for others. This may turn into a knitting blog as time goes on. Fair warning. I've "discovered" Elizabeth Zimmerman this winter and fallen in love with her techniques, and especially with her zest for all things garter stitch! Someone once said (or I read it somewhere) that she was like an knitting "engineer." I think of her as the Albert Einstein of knitting. A couple years ago, I started making her Baby Surprise Jackets from a pamphlet from Schoolhouse Press and couldn't stop. Now I'm making her hats that look like bonnets, all garter stitch, the pattern for which is in the book called "Knit One, Knit All" that has been compiled of many of her garter stitch projects. These hats are addictive! If you have this book, the pattern calls for a bulky or chunky yarn, but I found if you use worsted weight, soft yarn, (I've been using Plymouth's Encore) it makes an adorable baby/child hat that knits up fast and looks sweet!